GoRedChef: Journey Of A Foodie Fool: The New Chocolate Tower Is In! The New Chocolate Tower Is In! 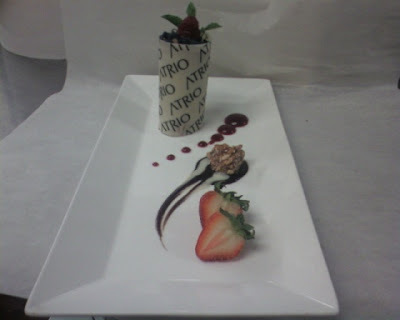 Popular dessert and Chef Micheal's Baby! Served with a Crispy White Chocolate Exterior. Raspberry, Chocolate and Creme Anglaise Sauces. And of course a crunchy Hazel nut nugget. This Hazelnut nugget took me forever to make... test after test...until I got it just right, it's so perfect. Roasted Hazelnut tossed with sesame seeds and sweet sugary syrup. A great bite!